Robert Mays: When Bob Myers was handed the executive of the year award last month, it seemed sort of funny. Sure, Myers hired Steve Kerr and held off on the Kevin Love–Klay Thompson deal — both moves that helped define Golden State’s season — but some of the franchise’s most significant choices, like drafting Thompson and Draymond Green, were far in the past. To recognize Myers was to recognize the years-long process of building the best roster in basketball. The most significant move Myers made over that stretch — in terms of the moving pieces required to make it happen — was rarely a focal point during Golden State’s run to 67 wins. 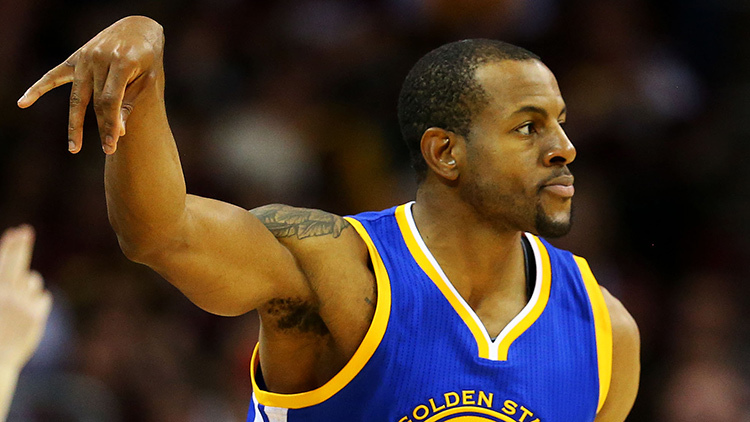 As Green and Thompson turned into stars, Andre Iguodala slid to the background, just one season after the Warriors unloaded a massive package of assets to bring him aboard. The day the deal went down, I remember not believing it was true. It felt like a coup for a team that already had a top-tier roster (when healthy) to bring in a player this versatile — Iguodala was among a handful of the best perimeter defenders in basketball, a dynamic force in transition, and a more-than-capable secondary ball handler who could free Steph Curry to wreak havoc off the ball. In his two years as a Warrior, Iguodala has been all of those things — whether as a starter or from the bench — but last night was the culmination of the decision that Myers was so intent on making two summers ago. For years, Iguodala has been one of the most unique players in the league, but in some ways, that’s why he was never designed to be the star he was made out to be in Philadelphia. His boundless athleticism and rare offensive skill set made it easy to understand why some would push for him to be a centerpiece, but his destiny was to be exactly what he was for Golden State last night. Back in the starting lineup and pinned as Kerr’s mid-fight changeup, Iguodala was tasked with guarding the best player in the world during a stretch when he’s looked next to unstoppable, and he was more than up to the task. He hit big 3 after big 3 as the Cavs dared him to. It was Iguodala who got out in transition and flushed down two easy dunks, pushing the pace into the red for Cleveland during the first quarter and giving Golden State the easy points it hasn’t had all series. When Doris Burke asked Iguodala about guarding James after the game, he mentioned that he’d been facing off against LeBron for a decade. It’s hard to swallow that the 2004 draft was 11 years ago, but that’s where we are. Going to the bench this year meant that in his 11 NBA seasons, Iguodala had played nearly every role he could on an NBA roster, from All-Star to quality starter to sixth man. But last night, he got to reprise the role that Myers brought him in to fill two summers ago — the player who could swing it all for Golden State. Hua Hsu: I’m probably the most analytics-dumb person to have ever published on this site. I’m fond of baseless exaggeration, story lines, and myth, even if I know deep down inside that most of this stuff withers away at the slightest scrutiny. I am #ALLIN on the symbolic consequences of Warriors-Cavs, especially the possibility that we are witnessing some sort of Clash of Civilizations pitting fluid, hybrid-everything, outside-the-box innovation against stern, industrial grit. All season long, I’ve understood on a basic X’s-and-O’s level how the Warriors have managed to be so historically great. But I’ve loved watching them for the simple reason that they’re a blast to watch. There’s something druggy about it all — the insane heaves from beyond the arc, the fun-house dribbling, the surreal way Steve Kerr’s lineups keep shrinking and shrinking. I can’t remember the last time a serious title contender in any sport was this much fun. Which is also why all of this is so strange. I have a very good friend from Cleveland who has seen omens everywhere these past few weeks, including one involving Joe Harris pushing a Mazda. Even the staunchest, most die-hard Warriors fan would probably admit it’s a weird feeling simply being in the NBA Finals, let alone being the favorites. My fear throughout the playoffs hasn’t been the Warriors’ jump shooting finally goink cold, it is my brain’s utter inability to assimilate every new piece of narrative that involves Oakland being one step closer to a parade. After losing Games 2 and 3, I didn’t feel any sense of tragedy or fatalism — it wasn’t a distillation of some kind of essential “Warriorness.” It was still unprecedented and strange. Similarly, I’m having trouble wrapping my head around what I just saw in Game 4. I remember fragments — that divot out of LeBron’s head, Iguodala-as-troll, that absurdly small lineup. It was fun again. It was the shape of jazz to come. And it still feels distant, unreal, visionary. At first, Cameragate contained only one conspiracy theory. There was 4:43 left in the second quarter. 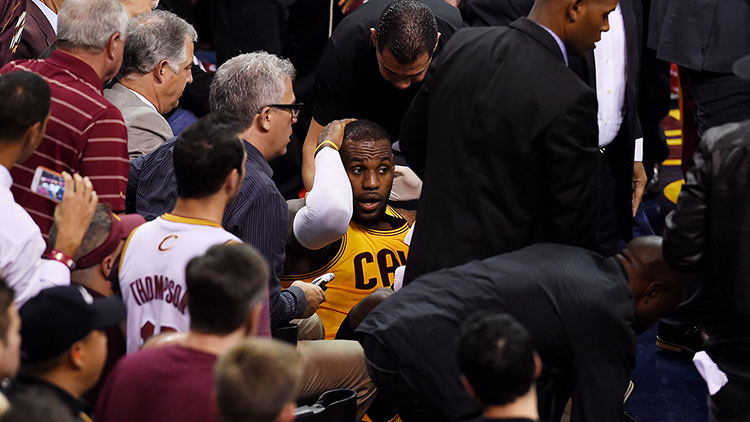 LeBron James drove baseline and got whacked by Andrew Bogut. James tumbled beyond the baseline. From the initial TV angle, it almost looked like he threw himself beyond the baseline to make sure he got a call from a crew that had been swallowing its whistles a lot. But after watching the TV replays, we could scratch that conspiracy. James’s momentum pretty clearly carried his face into a TV camera. Then Cameragate became a Wim Wenders movie. The questions included: Can a TV camera hurt a player … twice? What do we voyeurs at home have the right to watch? 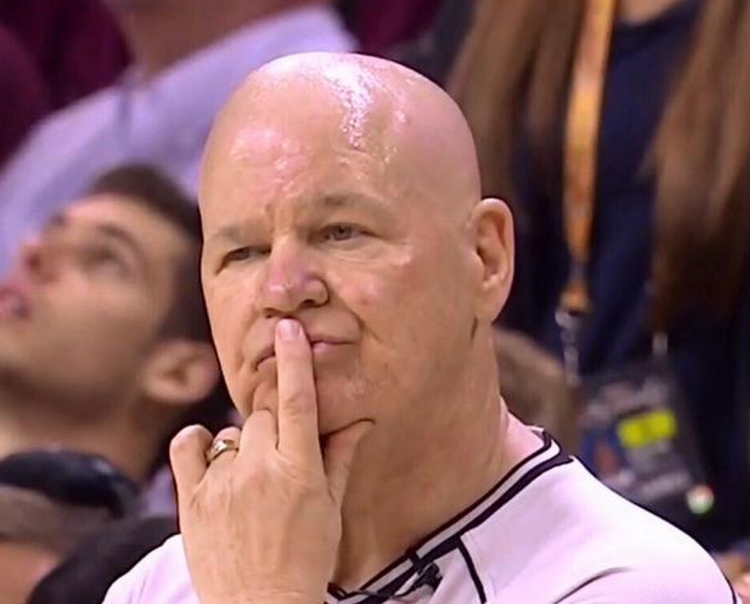 And is a Cavs security guard going to be the person who decides? The aftermath was hectic and strange. Nike’s Lynn Merritt — who has a thing about cameras — came over and told the cameraman, “It is your fault.” It was not his fault. Though a lot of players agreed that baseline cameras are a hidden menace. Meanwhile, another cameraman had popped over and had begun to film James as he writhed in pain. A shot of the last walking Cleveland Cavalier covered in blood might have been the shot of the Finals. But then a security guard shooed that camera away — a semi-humane gesture I’d guess none of us has seen at a sporting event before. No one did anything especially venal here. It was hard to know what happened from TV right way, and I can only imagine it was harder from the fourth row. More than anything, Cameragate points to just how strange it is to watch injuries on TV. For all the announcers’ hushed tones and special music they play during Fox’s NFL games, there’s still something queasy about the whole thing, as if the player is being stripped of his last ounce of dignity at the moment when he needs it most. Anderson Varejao, Matthew Dellavedova's coffee runner, seen entering Cavs locker room with 2 fresh cups. Danny Chau: TWEET SPONSORED BY SHUMPTOWN COFFEE ROASTERS. Goldsberry: The Cavaliers are performing admirably given the losses of Kyrie Irving and Kevin Love. But those guys are obviously important, and their ability to score from the perimeter was sorely missed last night; the Cavs lived through an absolute jump-shooting nightmare in their Game 4 loss. Look at these numbers: They made just 6 of 45 shots outside the paint. That’s 13 percent, and that’s not gonna get it done against Golden State. LeBron’s championship teams in Miami decorated the perimeter with guys like Ray Allen, Shane Battier, and Mike Miller (back when he was still alive), who could all be counted on to knock down the catch-and-shoot opportunities beyond the arc that James works so hard to create inside of it. But with the losses of Love and Irving, the Cavs are leaning on dudes who just aren’t nearly as reliable, and it was bound to catch up with them at some point. 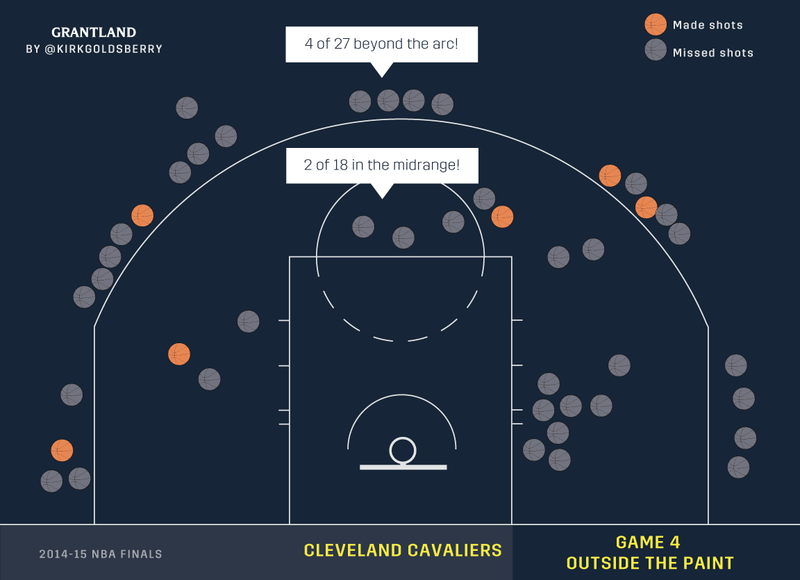 Game 4 was the point; the Cavs went just 4-for-27 from beyond the arc and 2-of-18 in the midrange. If this team has any chance of winning this series, somebody has to start knocking down shots. J.R., I’m looking at you, man. Chau: Leading a Cavaliers pregame huddle in the Q arena tunnel, LeBron James said something incredibly, improbably true: “No one plays harder than us.” It’s been the most obvious truth throughout these Finals, but can we stop to think about that for a second? James is the leader of a team that doesn’t win so much as survives. We’re so far removed from Hollywood As Hell as an idea affixed to LeBron, whether we’re talking about his time in South Beach or the Wonka-like offense emporium we’d all imagined from him and the rest of the team in the preseason. Any shred of Hollywood has given way to an L.A. apocalypse. The only way the Cavs can win this series is if they die a little less than the Warriors, which is almost a comically tragic strategy to adopt when the Warriors have at least three more ready-and-able bodies at their disposal. For the first three games, these Survivalist Cavs dropped the entire series — the Warriors, the team itself, seeds and peel included — into one big mortar and mashed away with a pestle. It worked about as well as anyone could’ve hoped. But they aren’t leaving much of themselves intact for the long haul. But for a good portion of the game, it looked like the Cavs might be able to achieve infinite mash. Steve Kerr’s decision to play small for the entire game meant there were rebounds to be had for Cleveland, and it damn near got all of them. 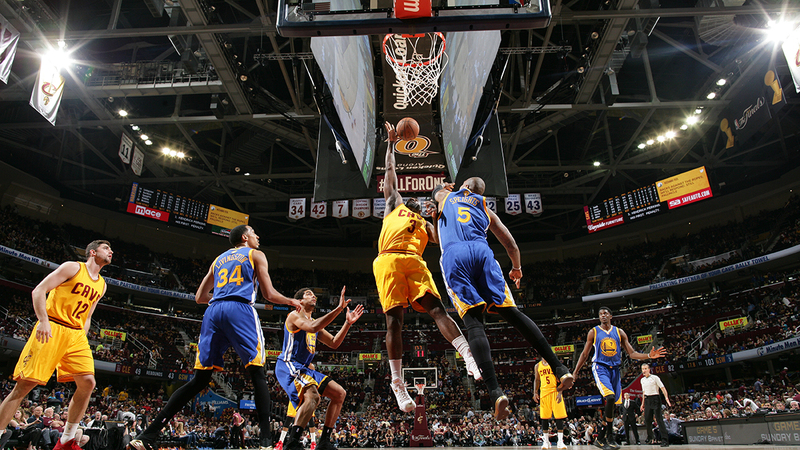 Of the 30 opportunities the team had for an offensive rebound, the Cavaliers grabbed more than half. 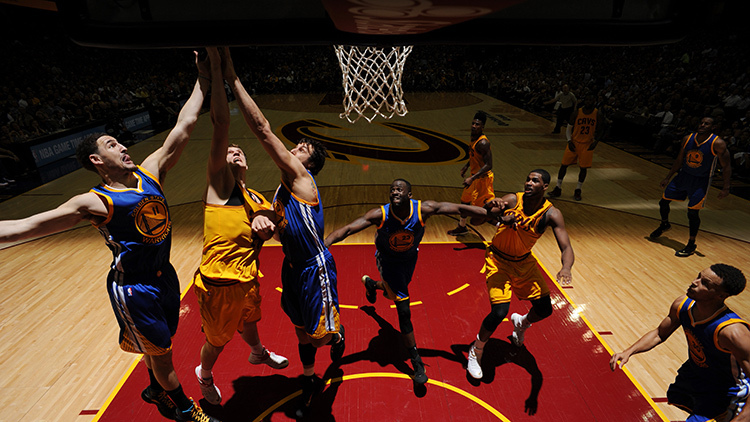 Timofey Mozgov and Tristan Thompson combined for 40 points on 15-of-26 shooting. With 1:03 remaining in the third quarter, the Cavs found themselves down by only four points, but it never got any better than that. And then it got so much worse. Kerr’s lineup change was, in one sense, completely reactive to how the series has gone so far. In another, it was the kind of move that flaunts Golden State’s superiority over the rest of the league — is there any other team that can essentially close their eyes and pretend their problems don’t exist and come away victorious? Mozgov and Thompson basically accounted for half of Cleveland’s points. But the Warriors can live with that if the rest of the Cavs are going to turn into the Grizzlies’ petrified remains. Sure, sure, when there’s nothing left to burn you have to set yourself on fire. But then what? Jason Gallagher: Rule of thumb: If there are 10 reasons to not do something, you probably shouldn’t do it. 1. It’s the NBA Finals. 2. This seems like the kind of unnecessary extracurricular activity that should probably be avoided if you’re playing in the NBA Finals. 4. Regular Segways, with handlebars, can be a little dangerous. 5. The owner of Segway Inc. died in an accident while riding a Segway. 6. Regular Segways, with handlebars, can be super dangerous. 7. THIS IS BASICALLY A REMOTE-CONTROL SEGWAY WITHOUT HANDLEBARS. 8. If the owner of Segway Inc. died while riding a regular Segway with handlebars, it is definitely possible that J.R. Smith could hurt himself riding a remote-control Segway without handlebars. 9. If your opponent sees something like this, he might assume you’re feeling waaaay too good about being up 2-1. But as long as you don’t tap your opponent on the shoulder as you pass him before the game, you should be good. 10. I forgot that with J.R. Smith, the rule is 10 bad ideas = one really amazing idea that can’t be stopped.